Hey look! They all fit on one 2' by 4' piece of plywood! I am still figuring out exactly how the chines/keel/stringers actually sit in the forms. Do they stick out a little or are they completely inset? Who knows. But, it has been a fun little project so far! From reading on Tom's site, the lofted points are where the outmost edge of the stringer should be. There is one page on his site that shows the notches in the frames but I sure can't find it now. 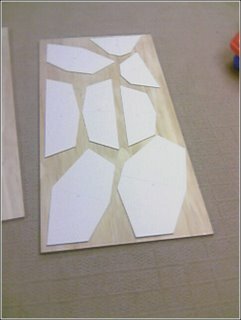 You may also want to cut a curve between the points so the skin doesn't rub the frame. I'm building a Sea Pup for my daughter and just finished cutting out the frames today. With any luck I won't have to shim it much but I'm not expecting perfection on my first yak. I'll post pics to Kayak Bytes when I get them sanded and looking presentable.